This week, our I·ATE Food Term of the Week will again host a special feature: following last week’s Halloween Special, we are now happy to share with you some insights from one of the world’s most famous and tasty culinary traditions, Greek cuisine. The Mediterranean country of Greece is rich in history, culture and tradition, but that’s not all. Their vast selection of traditional food makes the country an ideal destination for anyone that loves good food. In fact, Greek cuisine is both delicious and healthy, and the preparation is also fun as it uses ingredients which are, for the most part, commonly available. The following are some recipes you can try out if you would like to sample ‘a taste of Greece’ at home whilst also enjoying the physical benefits of these healthy meals. You can also take this opportunity to learn some interesting Greek food terms, which could turn out to be very useful when travelling to this amazing country! A really easy dish to prepare if you can get your hands on some fresh sardines. These fish, which are usually quite common in the Mediterranean region, have some pretty good qualities to their name as they are rich in omega 3 oils, protein, vitamin D, phosphorous and calcium. In this recipe, they are very easily prepared and further enhanced with a few extra ingredients to keep the delicious flavour of the fish. The baked sardines (in Greek: σαρδέλες ριγανάτες, pronounced sar-THEH-les ree-ghah-NAH-tes) are generously topped with Greek extra virgin olive oil, garlic, sea salt, parsley and lemon and served with a lovely tomato sauce which makes for a delicious accompaniment. Did you know that legumes have the third highest score in protein content? This traditional and super healthy lentil soup is a good compromise if you want to experience authentic Greek cuisine while also monitoring your calorie intake. Fakes is the Greek word for lentils, a super-food high in protein, fibre, vitamins, minerals, and magnesium: a very powerful energy boost for your travels! It’s very simple to prepare, and if you get to travel to Greece during winter, you will surely bump into this specialty. The additional ingredients are bay leaves, tomato purée, onion and garlic; once cooked, this delicious fakes soupa is served with a drizzle of olive oil and a sprinkle of red wine vinegar. Secret tip: top it with some authentic feta cheese crumbs, and enjoy! This Greek dip is perfect for an appetizer: you can have it with a cold drink, looking at the amazing sunsets Greece offers during the summer. The main ingredient of this dip is eggplant, a super healthy and tasty summer vegetable whose sauce you can add to a meat dish or just have it on its own. Moreover, eggplants contain a lot of dietary fibre and antioxidants; this dip is commonly served with lemon juice and garlic, used to flavor it. Also common components of many Greek dishes, these two ingredients have numerous health benefits: garlic is a powerful immune system booster, and lemon is high in vitamin C.
Melitzanosalata is best served with some crusty bread or home-made pittas, and why not try it with some feta dip? Enjoy! 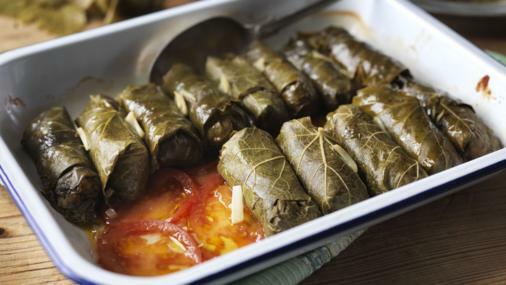 Another useful Greek noun: the origin of it is the term dolma, which means “filling” in Turkish. Any stuffed dish is worth a look! In this case, we have grape leaves filled with rice, minced lamb meat, garlic, onion, and many other kinds of vegetables. This time we chose to add the recipe of this dish; it might look difficult to prepare for a beginner, but it’s definitely worth the challenge! Bake your rolls in the oven, and enjoy your homemade piece of Greek culture! Preheat the oven to 180C (350F). Combine the rice, onion, meat, herbs, salt and pepper in a bowl to make the filling. Fold in the tomato purée. Take one grape leaf and place it vein side up on the plate. Heap the centre of the leaf near the stem edge with a full teaspoon of the filling. Fold up the stem end over the filling then fold both sides towards the middle and roll up. Take caution when rolling not to make it too tight as the rice inside needs space to expand when cooked. Place a layer of tomato slices or left over grape vine leaves on the base of an ovenproof dish to shield the stuffed leaves from burning. Arrange the stuffed leaves on top while inserting pieces of garlic between them. Sprinkle lemon juice and add about 150ml cold water (5 ¼ fl oz.). Use oiled foil to cover. Place them in the oven for about 45 minutes and if necessary add water. Serve, and enjoy! Raise your hand if you have never heard of Tzatziki, the famous dressing for gyros or Greek salad which also makes a nice dipping sauce for veggies. We can find Turkish origins in this dish too, because the Greek word tzatziki comes from the Turkish word cacık; the basis is made with yoghurt, which needs to strain for about 8 to 10 hours; garlic and cucumber are then added. Combined with souvlaki, chicken meat skewers which are commonly treated as a fast-food, it makes a delicious combination of flavour, together with a good amount of protein which, with a vegetable side, will turn out to be a rich nutritional meal as well as a delicacy to experience. You can find more information and curiosities about Greece on Jess Miller’s food blog, a useful source of inspiration if you want to impress your Greek guests, if you are preparing for a trip to Greece, or even if you just want to add a healthy, Mediterranean taste to your daily meals. We hope you enjoyed this dive into Greek food; don’t hesitate to let us know of any extra tips of food specialties in this Greek-focussed I·ATE Food Term of the Week! Liam Kennedy – Schuman Trainee at the Terminology Coordination Unit of the European Parliament. Graduate of Journalism with a Language (French) at Dublin Institute of Technology. Currently completing a Masters in Translation Studies at University College Cork.